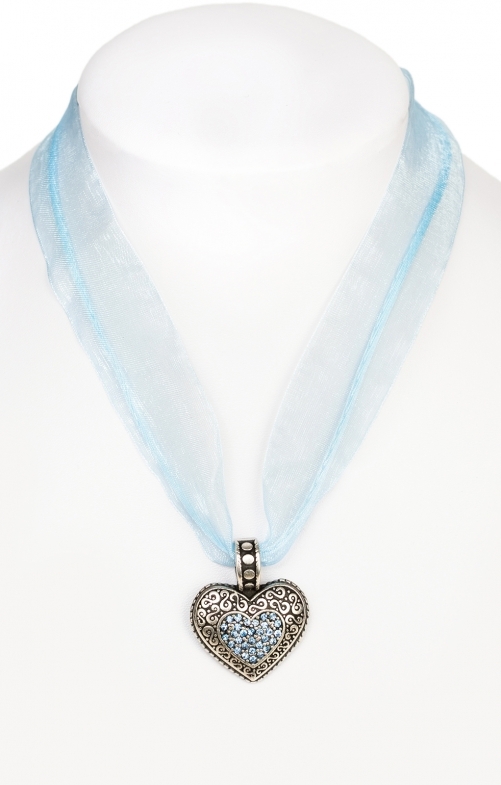 Dirndl chiffon choker with heart pendant. Colour light blue. What would the traditional costume without the lovely accessories that make a traditional outfit or a dirndl really complete. The necklace from the house of Schuhmacher is a combination of chiffon ribbon and costume cord. This flatters the neck and the colour of the neckline is very good. The filigree metal heart pendant is set with matching rhinestones and decorates the costume necklace in a perfect way. Material: Satin- und Kordelband. Nickelfrei. Länge verstellbar 38 - 44 cm. Süße Kette für ein Dirndl!